InjuredPixels is a free software that will check LCD monitor for defective pixels. This program can be used on a new or used monitor. This checks for defective or dead pixels. You will be able to inspect the screen by use of a primary color so that you can check for colored, white or black spots on your screen. InjuredPixels is easy to use. 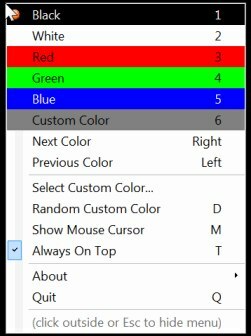 Using arrow commands or click for cycling through colors and click right for main menu commands. There is no installation required for this program. Just open the file and click. InjuredPixels free computer monitor diagnosing software enables a user to tell if a LCD screen would be defective before purchase. It can also check a recently purchased screen so that it may be replaced during a warranty period. By having a primary or custom color, you can quickly see if there is a problem with the pixels in the screen before you purchase a screen of LCD. It runs easily and using the commands is easy. You can use click commands or use the arrow keys for each of the processes that are used. This program will run on Windows products such as 7, XP, and Vista. You will have to have Microsoft .NET Framework 2.0 or above in order to use this program. This is a direct run program that requires no installation to run. This is a very easy way to get the information that you need.